Who has spent this festive season eating? We have. We have been eating everything and anything, because that's what you do this time of year. When you go over to dear old Auntie Nance's and she bakes 5 different types of cakes, you must try at least one slice of each. After all, no one wants to offend this time of the year. So after tasting at least 50 new recipes in the last 10 days, we have decided that we are all inspired for some good old-fashioned cooking in 2012. We want to cook healthy, with ingredients that we buy fresh from the farmers markets during the week and dabble in some sweet treats on the week ends. This Yogurt and white chocolate pannacotta from The Hungry Girls Cookbook Volume 3 has caught our eye, so much so that this might go straight to the first week end of the New Year. Might have to get us some of those darling kitsch 50's plates too, to really seal the deal. Maybe a little on the fussy side? 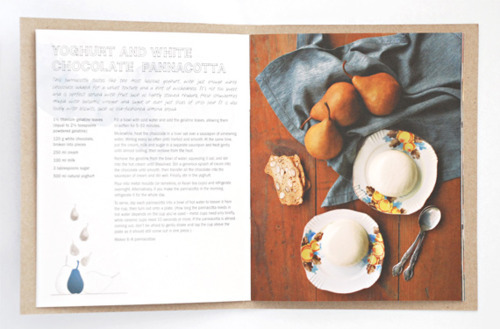 No need to fret... With 3 Volumes out now, The Hungry Girls have recipes catering to all palette types and occasions. Note to self - the first two volumes are especially handy to all those vegetarians. A copy can be yours for a mere $35 and can be purchased from numerous spots around Australia and even abroad. Craft Victoria has copies of Volume 1, 2 & 3 at 31 Flinders Lane.